Feeling good about your last oil change? Hawthorne Auto Clinic customers donated over 3000 gallons of used oil last year to provide funds for heating assistance to low income Oregonians, and most of them don't realize it! Oregon HEAT's Oil Recycling Program gets funds from donated oil drained from vehicles by shops and fleet garages and picked up for re-refining by a local company. Last year Oregon HEAT helped over 6000 household around the state keep warm when temperatures dropped. Here's how it works: Oil and other petroleum - based fluids we drain from your vehicle, or oil you drain from your own vehicle and bring us to recycle, is transferred to our double-wall 300gal storage tank. 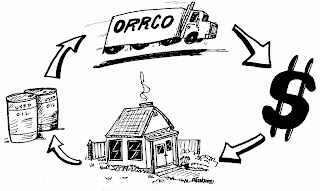 Oregon Re-Refining Company (ORRCO) pumps out our full used oil storage tank every few weeks, and makes a donation to Oregon HEAT's Oil Recycling Program. The program provides payment for all types of heating fuels to clients in need. Imagine what could happen if every car owner encouraged the shop changing their oil to donate used oil to Oregon HEAT, or switched to a facility supporting this program! Not only is the dirty oil getting rerefined to lube again, working toward energy independence in this era of rising crude oil prices, but more of our needy neighbors can keep their heat on.